The Telegraph: The second of three collaborations between Charles Crichton and T E B Clarke, it’s an austerity-era fantasy, a pre-Ronnie Biggs dream in which Alec Guinness’s Pooter-esque salaryman devises the perfect robbery: smuggling £1 million in gold bullion to France in the form of Eiffel Tower paperweights. Helped by a peerless script and a great team of actors (Alfie Bass and Sid James as professional thieves; Stanley Holloway as an oratory-inclined artist-scamster), the film is both a joyous comedy and a tense thriller. Indeed, its climactic car-chase sequence is easily as dramatic as any of those found in today’s summer blockbusters. Somehow, the brief appearance of Audrey Hepburn never fails to surprise: she’s a glimmering diamond amid the unvacuumed carpets of the Ealing universe. Equally startling: the delirious scene, a less malevolent analogue to that on the Ferris wheel in The Third Man, where Guinness and Holloway descend the Eiffel Tower. Round and round they go, dizzied by vertigo, bits of their clothing flying out over Paris, laughing at the madness of it all: they’re as exhilarated as we are. The Guardian: It's tremendously good fun, though lighter in tone than Ealing's two scabrous masterpieces Kind Hearts and Coronets and The Ladykillers, and not quite matching their elegant perfection; I've never been able to rid myself of the feeling that, however superbly set up, the aftermath of the heist itself is ever so slightly lacking in tension. But Holloway and Guinness's chase down the staircase of the Eiffel Tower has a Hitchcockian, vertiginous quality. Alfie Bass and Sid James, playing the other criminals, are classic supporting turns; like Holloway, they are the kind of organic, garden-grown character actors that Britain may not produce any more. A before-she-was-famous cameo from Audrey Hepburn is a surreal frisson. The Quietus: On this latest viewing of Lavender Hill Mob I notice Guinness and Holloway's curious lack of wives or girlfriends. It's the kind of relationship that more modish critics might now describe as a 'bromance' or 'homosocial'. When they break open the mould on their debut golden Eiffel Tower, these childless, women-less men give each other tender glances. “Our firstborn!” says Guinness. I tend to agree with the review that this is good but not as great as kind hearts or ladykillers. Still definitely worth seeing. I saw this a few years ago and pleasantly surprised to see it pop up on FanFare. My husband suggested we watch it because we live by the 'Lavender Hill' referenced in the movie although based on the notes on Wikipedia it doesn't look like it was actually filmed anywhere near it. I distinctly remember the car chase scene being quite entertaining and I was delighted with the way the policemen just sort of hopped onto the back of the police cars and hung onto them with one hand. I guess they could do that back then because cars couldn't have been going more than 30mph or something like that, but it was certainly fun to watch! I also do agree that it's a good balance of both thrilling and funny. There were some truly tense moments but the humour wasn't out of place. Sounds like I'll have to check out Ladykillers and Kind Hearts though! like_neon: you could give Passport to Pimlico a go. 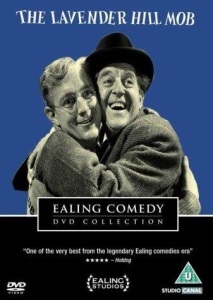 It's another Ealing comedy of high standard and while it was not filmed in Pimlico you might recognise Lambeth. Though prioritise Kind Hearts, it is a superb film! Other Ealing classics include Whisky Galore! (1949), The Titfield Thunderbolt (1953) and The Maggie (1954). Crichton also redid several Ealing gags in A Fish Called Wanda (1988).